Well, I am 99.9% convinced that it IS NOT. Let’s see why. I imagine that Rogers would have been pleased that Colin was experimenting. I can imagine, as well, how critical he would have been of the hasty conclusions Colin drew from those experiments, at least from what we can see of them on his blog and in comments here. Colin produced something that conceptually might look something like the image on the shroud. But so did many others. Even Jackson did. (We must say something more about Colin’s repeated references to the work of John Jackson: riding coattails, it seems. We will come back to that). Cellulose molecules are folded back and forth in a fairly regular arrangement, and they show the properties of crystallinity. This is called a "fibrillar structure." When you rotate the stage of a petrographic microscope with crossed polarizers while looking at a linen fiber, straight lengths change from black through colored to black again every 90%. The fiber is birefringent and has an ordered structure. When cellulose fibers are heated enough to color them, whether by conduction, convection, or radiation of any kind, water is eliminated from the structure (the cellulose is "dehydrated"). When water is eliminated, C-OH chemical bonds are broken. The C- free radicals formed are extremely reactive, and they will combine with any material in their vicinity. In cellulose, other parts of the cellulose chains may be the closest reactants. The chains crosslink.Crosslinking changes the crystal structure of the cellulose, and you can see the effect with a polarizing microscope. When cellulose starts to scorch (dehydrate and crosslink), its characteristic crystal structure becomes progressively more chaotic. Its birefringence changes, and not all parts of a straight fiber go through clear transitions from dark to light at the same angle. Zones of order get smaller and smaller. It finally takes on the appearance of a pseudomorph and just scatters light. A significantly scorched fiber does not change color as the stage is rotated between crossed polarizers. The crystal structure of the flax fibers of the Shroud shows the effects of aging, but it has never been heated enough to change the structure. It has never suffered chemically significant irradiation with either protons or neutrons. No type of radiation that could produce either color in the linen fibers or change the 14C content (radiocarbon age) could go unnoticed. All radiation has some kind of an effect on organic materials. This proves that the image color could not have been produced by thermal or radiation ­induced dehydration of the cellulose. Image formation proceeded at normal temperatures in the absence of energetic radiation of any kind. I think Rogers would have pointed out, as I and others have already attempted in one form or another, that there are many characteristics of the image that cannot be ignored. Since Colin is interested in what Rogers might think, I will confine myself to some image characteristics that Rogers specifically mentioned, I will use Rogers’ own words. Direct microscopy showed that the image color resides only on the topmost fibers at the highest parts of the weave. The color density of any specific image area depends on the batch of yarn that was used in its weave. The cloth shows bands of slightly different colors of yarn. Some areas show darker warp yarns and some show darker weft yarns. In some places bands of darker color cross. In other places bands of lighter color cross. The effect is somewhat like a plaid. Anna Maria Donadoni, a curator at the Museum of Egyptology in Turin, pointed out locations where batches of yarn ended in the weave and new yarn had been inserted in order to continue weaving. The yarn ends were laid side by side, and the weave was compressed with the comb. The ends are often visible, and the overlaps correspond to zones of different color in the weave. The different batches of yarn show different colors. Where darker bands of yarn intersect image areas, the image is darker. Where lighter bands intersect an image area, the image appears lighter. This proves that the image color is not a result of reactions in the cellulose of the linen. . . . This observation is extremely important when tests are being made on image-formation hypotheses. If image color is not simply a result of color formation in the cellulose of the linen fibers, image formation must be a much more complex process than we originally thought. 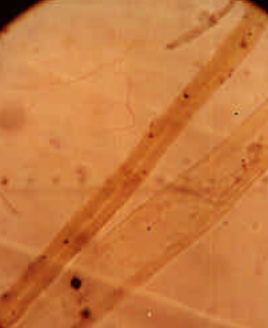 Adhesive-tape samples show that the image is a result of concentrations of yellow/brown fibers. The image does not fluoresce under ultraviolet illumination. . . .
No image formed under the blood stains. 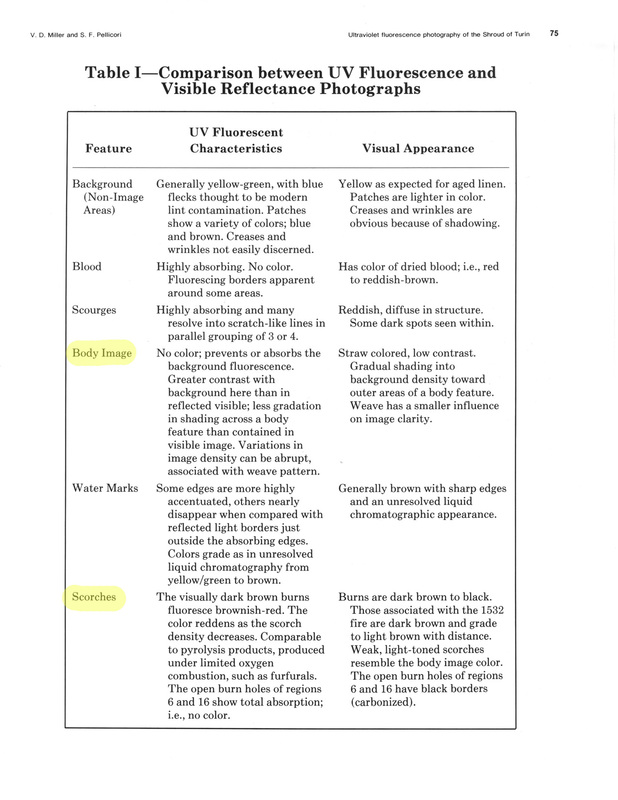 The image-formation mechanism did not damage, denature, or char the blood. The blood can be removed with a proteolytic enzyme. The blood produced hydroxyproline at low temperatures in the pyrolysis/ms spectra. It was never heated significantly. Image formation had to be a low-temperature process. Image color can be chemically reduced with diimide, leaving colorless cellulose fibers. All image color resides on the outer surfaces of the fibers. The medullas of colored image fibers are not colored: The cellulose was not involved in color production. NOTE: The picture, here and above, shows a image fiber from the shroud, magnified 400 times. It shows that the medulla is completely colorless. Rogers was also able to show that the medulla of a scorched linen fiber is colored through its entire diameter, and the medulla usually appears to be darker than the mass of the fiber as a result of reactions at its surface. Does Colin have a way around this? The color of image fibers was often stripped off of their surfaces, leaving molds of the fibers in the adhesive. Growth nodes can be seen in the molds. The colored layers show all of the same chemical properties observed on intact image fibers (see 12 above). All of the color is on the surfaces of the fibers. The colored layer is 200-600 nanometers thick. . . . The question isn’t if 200 nanometers is too thin for imaging. It isn’t, of course. Visible image content on the shroud is that thin. Rogers had shown that. If nothing else, the ENEA team confirmed it. The real 200 nanometer question is how in the world, with manual methods on such a large scale as the shroud, hypothesizing perhaps along the lines that Colin proposes, a heated statues made of metal, stone or molded clay pressed up against a piece of linen resting in sand, can it be possible to create such a thin, thin scorch. It boggles the mind to think that heat sufficient to provide visible coloring at the surface would not, by means of conduction, penetrate deep into the fiber. Rogers, has, of course, shown that coloring (darkening) caused by a scorch simply isn’t superficial like the shroud image is. Rogers knew it wasn’t a scorch. So did Jackson, by the way. It may be a bit unfair to keep mentioning Jackson, as Colin does, giving him credit for pioneering the scorching-with-a-statue method. Jackson is well known instead for proposing that . . .
Isnt that a case of the bag getting damp and the water being a good conductor as well? Or that it is sufficiently thin that heat can get through at a fast enough rate to stop hot spots forming….you can do the same experiment with a rubber ballon and water (though I never took it to boil point…the kids were too bored after 15s!). But, if as you claim cellulose is such a good conductor as well, wouldnt the heat then more easily get through to scorch more than 200nm? And I still cant understand how your thermal model would give the faint image on the other side of the same cloth. Perhaps elaborate that part of your theory more, so I can get a proper understanding of it as it does have many pluses in its favour, but also some minus as mentioned by Dan above. You mentioned somewhere about the lack of UV fluorescence as not problem…I wasnt clear why, perhaps expand on that as well. What cannot be explained away is the ability of cellulose to conduct sufficient heat to boil water WITHOUT degrading. That is testimony to its rigid, zipped up structure (due to multiple interchain hydrogen bonds that can be broken and reformed to transmit thermal, i.e. kinetic energy, without loss of overall integrity). 1. I like this posting very much, can follow the technical commentary very well, but not being a chemistry specialist, cannot make a detailed technical comment on the argument. Being a relative latecomer to this Blog site, I appreciate the quotations from Raymond Rogers. 2. My objections to the statue thermal imprinting proposition come from its unlikelihood. It beggars belief that anyone, even an enthusastic relic forger, would commission such an object. (a) There was insufficient anatomical knowledge to create the accuracy of detail; (b) Any such lifesize statue woud in fact be more impressive than its mere image on a cloth; (c) There is no historical record of any such statue, and there is no contemporary tradition of making such statues with all the realism required. (d) It defies any contemporary art forms. (e) It contravenes conventional belief about the crucifixion, e.g. wrist nailing, and consequent thumb flexure. 4. I pick up Colin’s comment elsewhere that all (scorched?) images fade over time. The (pseudo? )-Abgar legend says that when Addai brought the image to Abgar, the image was shining brightly (possibly a legendary over-statement). Inquisitions of the Templars say that the head that they allegedly worshipped had a “terrible” aspect. The present image has neither of these aspects. On the Barrie Schwortz site, there are comments that the image seemed somewhat faded after the most recent restoration work. It suggests that the image may have faded over the millenia, and that if so, it may well have been a lot more impressive than it now appears. 5. The Shroud is unique in all of relic history. Forgers typically imitate. They seldom create originals or other unique objects, even when there is a lucrative trade in the genre, whether art, artifacts or relics. Their copies are usually quickly discovered as forgeries. Actually Barrie, I think that fact was posted very early in this discussion and I think skeptics are well aware of this fact, such as our friend Bod here. But for some reason they tend to ‘forget’ these most telling scientific facts, skirt most all facts actually and go on in their morosoph fashions. Actually a link to some of these UV fluoresecence photos would go a long way to conclude a couple of discussions going on here, if possible that is with much appreciation. Sadly, that’s why I don’t post to blogs very often. I don’t have time to waste debating folks who simply choose to ignore the published science. They obviously have already made up their minds so why bother? Perhaps they have more time on their hands than I do, but I am not interested in arguing for the sake of argument. That is why I never try to convince anyone of anything. Frankly, I don’t really care what this gentleman thinks and will leave him in your and Dan Porter’s able hands. The article I referred to was published in a highly respected scientific journal. However, due to copyright restrictions, I do not have the right to distribute or publish the article or the UV fluorescence photographs it contains in a public forum. The photographs are all copyrighted to Vern Miller. Perhaps that will be helpful to your skeptic (but I doubt it). Have a great weekend! Wrong, wrong, wrong. There are degrees of pyrolysis that are likely to produce different thermal degradation products with different patterns of single and double bonds and thus differing fluorescence characteristics under uv. What is more, time, oxidation and acquired quenching agents are likely to diminish any initially acquired fluoresence. But since you “don’t really care what this gentleman thinks”, Mr/Dr/Prof(?) Schwortz, then I shan’t impose on you further than I have done already. I would hate you to think that i was maliciously attempting to undermine that bastion of chemical certainty behind which you and some others here have taken refuge. I would just leave you with the thought that cautious scientists learn, often the hard way, to distinguish between experimental evidence that is suggestive rather than conclusive, and to avoid giving ‘most favoured’ status to findings that just happen to fit with preconceived notions…. Oh, and I have to tell you that using fluorescence as a marker for “scorching” is not terribly scientific, unless you know precisely what it is you are measuring, and the factors that might be affecting the result in any given situation. Understood and thanks for the reply. The table seems to show that paper has one of the lowest thermal conductivities of the solids listed. On the face of it, it seems to be saying the exact opposite of what you are saying about cellulose….Care to comment on that disparity? My point was to show that the major effect in your paper bag experiment could be explained by the conductivity of water, not of cellulose (which was the point of your experiment….so it was a false conclusion you drew from your experiment). I did not say that the conductivity of water was the only thing going ….I even mentioned perhaps its was the thinnest of the barrier that allowed sufficient heat flow to stop hotspots developing. So you are putting words into my mouth. Going on to the rubber balloon experiment, the tables show that rubber to have more than 3 times the thermal conductivity of paper, so though rubber survived the heating, you can not conclude paper (without being water saturated) would as well. So I think your logic is skewed as well as your science, and I say this kindly. I left it an open case, in need of further checking. So to re-iterate, you got to be careful in science to jumping to conclusions. However the figures in the table fairly demolish your argument about cellulose being a good conductor, which was your main contention. But these are diversions….I’d like to focus on the point about the lack of UV in the scorch images. BTW I am generally a sceptic myself but only really started to look at the Shroud following the Tom Chivers article in Dec. The one think that struck me is actually how good some of the Shroud research and evidence is….I’ll most probably remain a sceptic, but more out of habit after 40 years in physics, its my mindset, but I’m honest enough to admit that the Shroudies seem to have the upper hand and pretty good evidence. I’m particularly impressed by the correspondences in the Hungarian Pray Manuscript, which I note you dismissed with some remark about the need to show puffs of smoke if its a set of burnt holes – that’s ridiculous (you assume the artist believe it ignited at burial? ), it made me laugh out loud, I thought to myself “Here’s a man who really knows how to shoehorn data to fit his worldview”. I do think the Shroudies have a point in saying that the sceptics avoid dealing fairly with the data, and claim too easily “Eureka, I’ve done it, I’ve shown the Shroud to be a fake” though missing much of its characteristics. Science has to be sceptical but also fair. …Errr, like claiming 99.9% certainty of it being a fake based on some very basic experimentally suggestive scorch data! I wouldnt call your experimental results conclusive at all…sorry, you really need more work on it to prove the case. Science cant be so slap dash! One other thing that should be obvious: A scorch caused by a heated statue would be deeper in the darker areas where there was more pressure, not with an even depth (much less one only 200nm) along the whole image. ^ Bod knows his hypothesis is flawed, just by the one fact you mention (and mentioned often before) but refuses to accept it…. You see guys, Barrie is completely right! It doesn’t matter how much evidence there is, skeptics like bod will always contest them. As Barrie also pointed out the whole scourch, statue, bas-relief thingy has been around for a LONG TIME, it has been attempted by many and ALL attempts FAIL to replicate the Shroud image in all it’s glory…Yet they still through maybe total ‘ignorance’ of this, will act as if it’s all new and anyone defending the Shroud are somehow fooling themselves….I won’t be paying anymore attention to bod’s posts as he most obviously refuses to accept decades of research. So what are you saying? That because there is a (poorly documented) claim that the image has an equal 200nm thickness everywhere, the image density on each fibre has to be the same all over as well? What about the idea that all image fibres are equally intense – that it is to do with the number of coloured fibres per unit area rather than degree of image intensity? The half-tone idea is compatible with a pressure-imprinting model – more pressure means more fibres in contact with hot surface, coupled with a saturation effect on each contact point. Re triple burn holes indicated in Hungarian Pray manuscript ~1192, mentioned in ArtScience’ comment above. The holes were very likely the result of a “trial by fire”, under Caliph Mu’awiyah reported by Bishop Arculf of Perigueux about 679 AD during his travels. Arculf reported that the cloth appeared to be about 8 feet long, (if Shroud, it would therefore be doubled). There are two sets of holes, symmetrical about the centre of the cloth, which would therefore fit his description, (but not the subsequent legendary detail of the actual trial). Sure, not science, but forensically evidential. Upcoming, exciting exhibition on the Shroud of Turin in Málaga, Spain Does Colin need to start over?